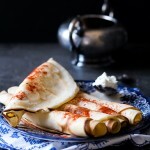 What pancakes are for the Americas, crepes (or as we like to call them, palačinke) are for the Balkans. 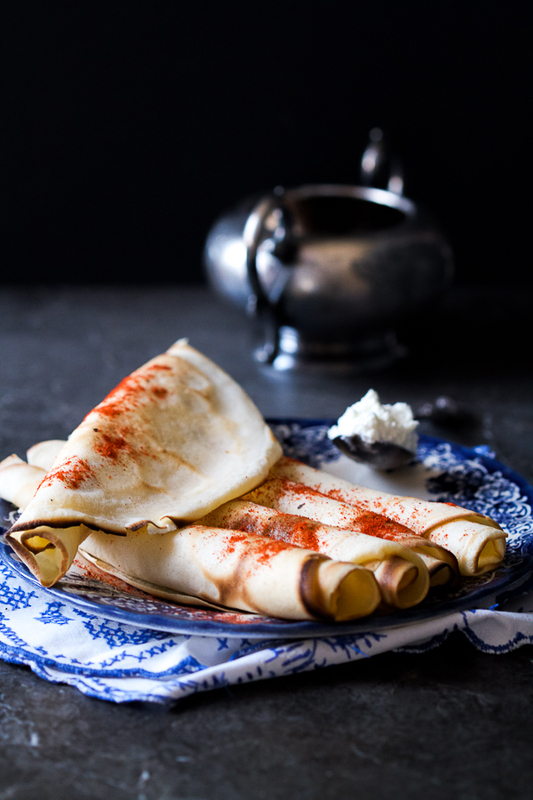 For lunch today we make the laciest, softest, most savory crepes filled with goat cheese, while in the video there are three different sweet options to choose from. If you’re already confident in your crepe making abilities, other recipes on the blog may be more up your alley. Try the baked crepes with mushrooms in tartar sauce. It’s a recipe where crepes have graduated to a dinner. Filled with soft mushrooms, smeared with deep tartar, they’re truly exquisite made this way. If you want something even more filling, stuff them with ham, and fry them to get the breaded crepes with ham and cheese. Although not a crepes recipe, something vaguely reminiscent are the chicken turnovers. I love crepes. Absolutely love them, whether savory or sweet. As a little boy, I repeatedly asked my mom to make them. She’d agree sometimes, and sometimes she wouldn’t. But I was a real complainer back then. The reason why I love crepes is because you can do anything with them. You can be creative to the max. They are great as both a sweet and a savory dish, flavor depending on the filling you use. And as far as fillings are concerned, the only limit is your imagination. The most important thing to consider when making crepes is the batter. It has to be the right consistency. It shouldn’t be overly thick, but instead as thin as possible. 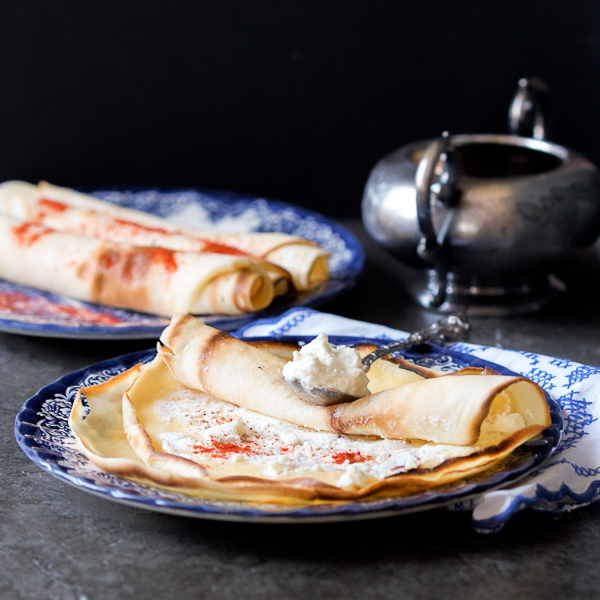 If the batter is too thick, it will move slowly on the pan, and the crepes will be «beefy». This is no good. 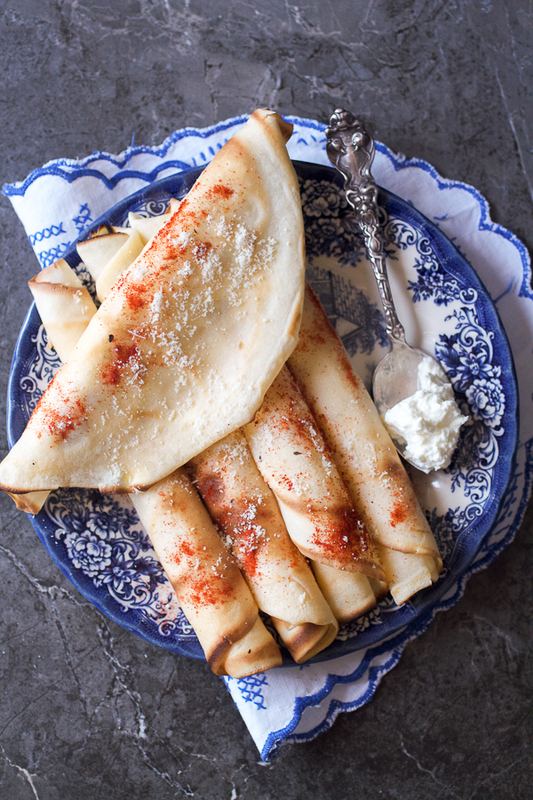 Crepes, to taste well, have to be as thin (lacy) as possible. And the only way to really accomplish this is to make sure the crepe batter is thin. You may need some time to get a hang of it. But with time, I’m sure you’ll be making crepes as thin as a sheet of paper. Another thing regarding the crepe batter. Some recipes avoid water altogether, and only use milk. The thought behind it is that the crepes will be more caloric and flavorful. My experience doesn’t agree with this assumption. The water is important because it thins out the flour, avoiding the «tough» crepe you get by only using milk. You’re welcome to use mineral water instead of plain though. As far as cooking them, it’s best if you have a specific pan just for crepes. They’re wide and thin, with low sides. If you don’t have one, use a teflon pan, or one made out of a non-stick material that prevents too much heat. This type of a pan will be of great help to you! Another tip for making them. The standard way is to oil the pan after every two crepes to prevent stickiness. The best way to oil the pan is to have a smaller bowl with oil in which you’ll dip a paper towel, and use it to coat the pan with. Repeat this process until you’re finished. It’s the simplest way to do it. There is another technique for oil to take into consideration: when making batter, add a little bit of hot oil to it, and use a hand mixer instead of spatula to mix. Just make sure the oil isn’t too hot or the batter will burn. This allows you to skip the oil in the pan altogether, as the batter has enough oil to prevent sticking. If you have some batter left over, leave it in the fridge for another time. Some say that the crepe batter really is best if it stays in the fridge for a few hours before it’s used. Another thing, the amount of crepe batter you grab with a ladle needs to be just enough to evenly cover the entire bottom of the pan, while making sure crepes are not too thick. That would be it. Enjoy! P.S. You can find the recipe for the strawberry sauce (syrup) here. Combine flour, eggs, salt and milk in a larger bowl. 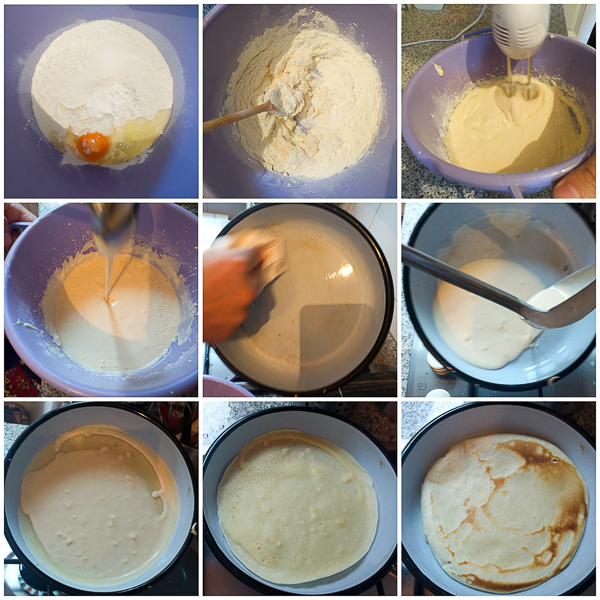 Mix the batter with a spatula for a few minutes, then turn on the hand mixer. Continue mixing with the hand mixer, slowly adding water as necessary. (You may need more or less water.) Mix until the batter is free of crumbs, and is completely smooth with a consistency (thickness) of heavy cream. Transfer batter into the pan by using a ladle (fill it up about 2/3s). Watching that the batter doesn’t leave the pan, swirl it around until the batter coats the pan bottom evenly. When the crepe has slightly browned on the bottom (about 30 seconds), flip it around to the other side. Place the finished crepe on a plate. Use the filling of your choice to fill the crepe up. You’ll get about 15-16 crepes with this mixture. Serve about 2 per person. Please note that the first couple of crepes are generally of a worse quality. You can split the batter in half, use up some, and leave the rest in the fridge. Use within 2 days. 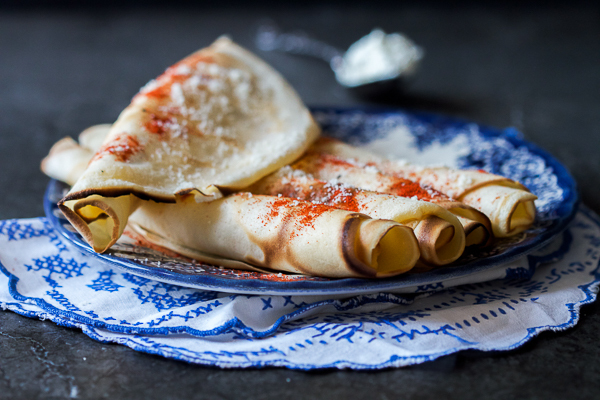 While you can reheat crepes, they are their very best when consumed the same day.